Four vehicles involved in a road traffic accident, will take up the city centers of Madrid, Barcelona, Málaga and Elche. The goal is to raise citizen awareness of the importance of observing basic traffic rules such as speed limits, and to avoid drinking and driving as well as other distractions, all of which are key factors in the prevention of road traffic accidents. We also want to shock people and get them thinking on social media about responsible driving and what can be done to prevent the large numbers of fatalities and seriously injured people. 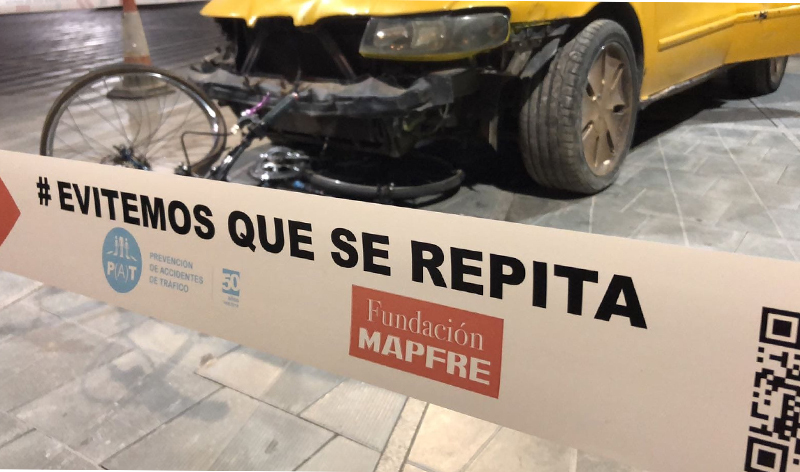 The #EvitemosQueSeRepita campaign, beginning today, is being promoted by the Association for the Prevention of Traffic Accidents P(A)T and Fundación MAPFRE, and coincides with the European Night Without Accident, which is held on the third weekend of October. Ole Thorson, chairman of P(A)T, made reference today during the campaign presentation to the fact thattraffic accidents are currently “one of the leading causes of serious injury and death in our society. In 2017, there were victims, of which 1,830 died and 9,546 were hospitalized with varying degrees of injury. Many of these victims live with the effects of their injuries for the rest of their lives. These figures demonstrate that we have a serious problem of which society is still not fully aware. The vast majority of these cases could have been avoided given that they were down to reckless driving. He also emphasized that “the “overturned” vehicles on display are also intended to overturn the country and demand responsible driving, as this is a fundamental component of the much-desired plan goal of reaching vision zero before 2050”. The chairman of this association, who this year completes a 50-year career dedicated to the families who have suffered the consequences of serious road accidents close at hand, also emphasized that, “if you are in a hurry you should take a plane or train, but not your car, and if you are suffering from anxiety and have taken psychotropic medication, drugs or alcohol, leave the keys behind and find an alternative, but do not get behind the wheel”. Along these same lines, Jesus Monclús, Accident Prevention and Road Safety Director at Fundación MAPFRE underlined the importance of these kinds of campaigns, which seek to “have an impact on citizens and make them think about the importance of acting responsibly and safely to prevent fatal consequences, which affect whole families for the rest of their lives”. He also referred to distractions at the wheel, “currently, the leading cause of fatal accidents, which is why we should insist on prohibiting cell phone use while driving, including using hands-free systems”. P(A)T, with headquarters in Barcelona, also has a national reach and offices in Elche, Girona, Madrid, Málaga, Merida, Orense, Seville and Tarragona. The installation has been set up in four of its offices. Cars which have been involved in accidents will be displayed in the following locations this weekend: the Plaza de Jacinto Benavente, in Madrid; the Plaça Universitat, in Barcelona; the Plaza Avenida de Andalucía, in Málaga; and the Plaza del Centro de Congresos, in Elche (Alicante).